He has everything under control. Except her. Reece Wilde put everything in his life on the backburner to protect his brothers and their struggling company, Wilde Security. With a major contract on the line, Reece can’t afford any mistakes…like getting caught in a red-hot, X-rated moment with wild child Shelby Bremer, who’s more trouble than he can handle. Now he’s being blackmailed. Shelby’s mile-long impulsive streak gets her in more trouble than she’d like to admit. Between her sister’s wedding, her coffee shop set on fire, and getting down and dirty with the groom’s brother, things are definitely coming off the rails. With both their careers and their safety on the line, Reece is determined to keep them both safe…even if it means a Vegas-style shotgun wedding. But gambling on a wild card—and a wild soul—is risky…and sometimes, it can get a guy killed. 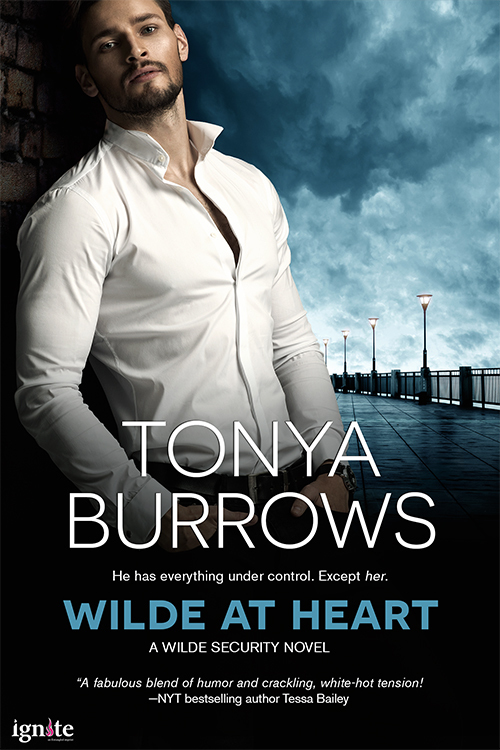 Tonya Burrows wrote her first romance in 8th grade and hasn't put down her pen since. Originally from a small town in Western New York, she suffers from a bad case of wanderlust and usually ends up moving someplace new every few years. Luckily, her two dogs and ginormous cat are excellent travel buddies. When she's not writing about hunky military heroes, Tonya can be found at a bookstore or the dog park. She also enjoys painting, watching movies, and her daily barre workouts. A geek at heart, she pledges her TV fandom to Supernatural and Dr. Who. If you would like to know more about Tonya, visit her website at www.tonyaburrows.com. She's also on Twitter and Facebook. I like the way this one sounds, I will definitely add it to my tbr list! Right now reading Sarah Andre's Locked, Loaded and Lying which has been a great read! Love her style which means I can't put it down. sarahandre.com is her site, I recommend.